On this page we profile a few of the many useful resources for researching Santa Cruz County history. For more detailed information, we recommend the book, Every Structure Tells A Story. Although some new resources have become available since its publication in 1990, and its focus is on real property, this book is a powerful tool for many types of research. U.S. Census Records are available on microfilm in some local libraries and online. People with a Santa Cruz Public Library card can access census records for free at Heritage Quest through the library website. Ancestry.com is available for free at the library on the library computers. The California Digital Newspaper Collection (CDNC) is a free online repository of digitized California newspapers from 1846 to the present. It has the Santa Cruz Sentinel from 1884 to 2010. San Francisco papers of the late 19th century, such as the Alta California and Call, often included articles on people and events in Santa Cruz County. This is a valuable resource that should be in every historian's toolbox. Click here for the website. In the early 1980s a dedicated group of volunteers began indexing the local news stories of Santa Cruz newspapers. About a century's worth of papers have been indexed so far, starting in 1856. Some of the Watsonville Pajaronian has been indexed, and also the Mt. Echo of Boulder Creek. Ask at the reference desk of your local library for assistance. Most of the indexes are printed volumes, but some are online. ﻿Another valuable tool is the commercial website Newspapers.com. It contains digital versions of Santa Cruz newspapers from the late 1800s through most of the 1900s, and the papers are searchable. There is a fee to use, but it is also accessible for free through the Santa Cruz Public Library.﻿ The Watsonville Public Library website has back issues of the Pajaronian on their website. "Sanborn Fire Insurance Maps are unique in that no other maps provide the level of detail, shape of buildings, outlying buildings, type of construction (wood frame, brick, etc. ), and use of the structure (dwelling, auto garage, etc. )," —from Every Structure Tells A Story. The maps only cover urban areas. The earliest maps within the county are those of Watsonville, 1873. Check with your local library or museum for their holdings. The most complete set is at the UCSC Map Library, and many of these are now online. 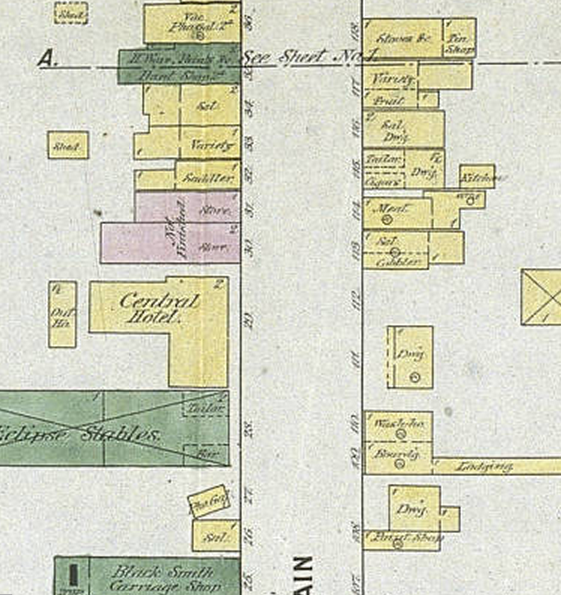 The Library of Congress also has Sanborn Maps online. The following article tells how to use these in research: Click here. Directory listings of businesses and individuals are a valuable source of information. They typically list the address, occupation or place of employment, and name of the spouse. Although often referred to as "city" directories, they frequently include unincorporated areas. 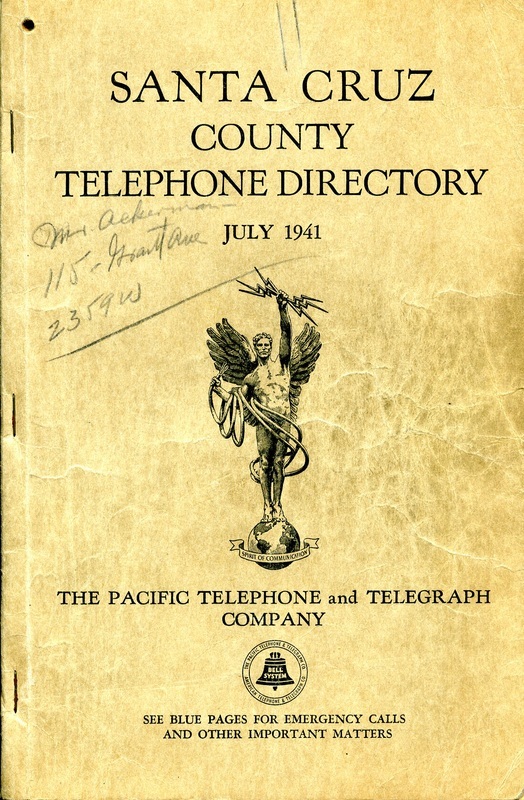 Directories covering Santa Cruz County are available beginning in 1867. Every Structure Tells A Story lists most of the directories, their dates, and availability. Major holdings are at the Santa Cruz Public Library, Watsonville Library, UCSC Library, Pajaro Valley Historical Association, and the Santa Cruz Museum of Art & History. Telephone books dating back nearly to 1900 are available either as hard copies or on microfilm in a number of local libraries and historical museums. These are useful in documenting the locations of people and businesses. They also contain old advertisements.